Madonna is renowned for popularizing the careers of many talented people such as William Orbit, Jean-Paul Gaultier, Dolce & Gabbana, and makeup artist Laura Mercier. 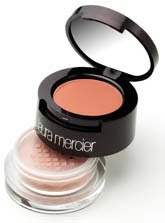 French makeup artist Mercier debuts her first Crème Cheek Pot ($34) this Fall. The two tiered pot has cream color on top for a fresh, flushed effect. The bottom half is a softer focus, loose power for an unfussy glow. The cream blush is not sticky nor does it smudge; ending with a smooth finish. The pure pearl powder minimizes the appearance of flaws and adds a shimmer radiance to the cheeks, thus the product tag line “makes cheeks pop. The overall product was easy to blend with other products and the powder helped set other makeup. Laura Mercier is always a hit. I don’t believe I have ever tried a poor product from her line, even if it is slightly more expensive. The cream cheek color is one for the makeup bag, and then you can decide if you prefer the top or the bottom?